Motorcycling at Coles Bay, Freycinet National Park. Part of the Great Eastern Drive up the scenic East Coast of Tasmania. A seventh-generation 4000 ha sheep station, Gala Estate is also home to a boutique vineyard. Enjoy your Tassie riding adventure while drinking in 360° views of the island’s stunning scenery. The cozy confines of a car can be restricting, especially when touring the thunderous natural surrounds of Tasmania. You want to be free; unleashed from that metal cage so you can breathe the freshest air on planet Earth while drinking in 360° views of the island's jaw-dropping scenery. 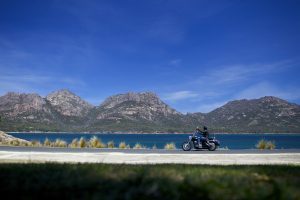 And Tasmania has some good news for motorcycle lovers -- the island's weather never gets too hot or too cold so you can take a liberating bike tour any time of year. Image thanks to Pete Harmsen. Australia's island state has well-kept roads, great infrastructure, low traffic and is perfect for an exhilarating ride. And here's what's great about a ride about Tassie -- it's all scrunched. It's a quick blast to the beach down from the mountains and the ride will take you over rivers and through wildlife-packed grasslands. It's as if some motorcycle God took all the best that Australia has to offer and consolidated it into one thrilling location. 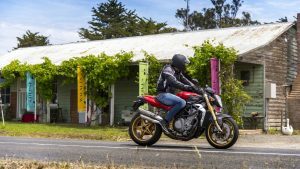 Motorcycle lovers from all over the world descend on Tasmania to take advantage of its well-known east coast ride. And this motorcycle tour is easily accessible by flying into Hobart, Tasmania's biggest city, and riding north. The east coast is covered in vineyards and features stunning ocean views. The Lake Leake Highway will take you into the coastal town of Freycinet where you can shack up for the night on Wineglass Bay. The road continues through the exhilaratingly narrow Elephant Pass where you can have a chat with other bikers at the Pancake House. The road then descends to St. Marys Pass down to the coast. Or you can choose to take the Tasman Highway through Weldborough where you can stop for a pint at its famous Pub in a Paddock. This highway hugs the coast to give you stunning views of the ocean beyond. You can then take it up to the north Coast of Tasmania where you'll find interesting little towns like Bridport. One of Tasmania's largest cities is the affable Devonport. This port town is where you'll find the Spirit of Tasmania ferries to the Mainland and is a great starting point for your exploration of the north coast. 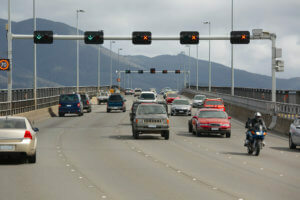 Head on out of Devonport west on Highway 1 for the ultra-scenic ride on the Bass Highway. This road is perfectly suited for a motorcycle tour. It has front row seats to the winds whipping in from the Bass Strait on the Roaring Forties. This Southern Hemisphere weather pattern brings the freshest air on planet Earth to Tasmania's north coast so flip up that visor to get a chest full of energizing oxygen. The road will take you through incredibly unique towns like Penguin and Burnie. You'll find the smallest Penguins in the world in Penguin, a cheeky little place that doesn't take itself too seriously. Stop here, take a seat on the beach at dusk and watch these tiny blue creatures come back in from a day's hunt on the Bass Strait in formations called rafts. You'll love watching them struggle against tiny little waves as they waddle back to their sandy subterranean homes for the night. Burnie is an old port town just beyond Penguin that has reinvented itself as an art haven for craftsmen and makers. Park your bike to explore one of the many shops in town or stay a little bit longer to learn a craft from one of the towns makers. Further on up the road, you'll find the Rocky Cape National Park. This stunning protected land is covered in wildflowers year round. Off in the distance, you can see The Nut, a towering volcanic plug in the small peninsula town of Stanley. Take your time navigating this rugged land while sampling some of the areas fresh produce, cheese and meat for an unforgettable bike tour. Image thanks to Tourism Tasmania & Kathryn Leahy. The west coast of Tasmania is truly a Wild West. The land is incredibly rugged which allows for extremely beautiful scenery, but it comes at a cost -- there is less infrastructure and the roads are not as well kept as they are in the east, south and north coasts. But the intrepid biker will be rewarded with landscapes that are found or else on planet earth. 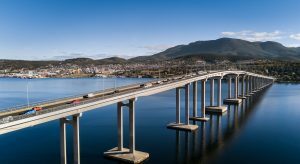 Your gateway to the west is on the Lyell Highway out of Hobart through Derwent Bridge. But it's highly recommended to schedule a bit more time to take a short detour through Franklin-Gordon Wild Rivers National Park on the windy Gordon River Road. This stunning drive will take you on twists and turns through some of the wildest lands Australia has to offer. Stop at one of the many short nature walks to access waterfalls, achieve towering views or to have a picnic. 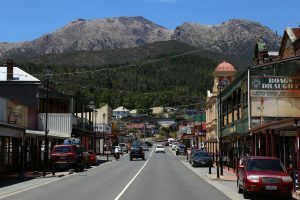 Then head on through the unique little town of Derwent Bridge to descend upon Queenstown. The Highway takes an incredible number of turns descending into this old mining town. From on high, you'll be able to see the eiry landscape that was created by the mining boom that Tasmania experienced through the 1800's. Mining and copper smelting has stripped the hills and mountains around Queenstown of timber and natural soils to reveal a colourful man-made moonscape. This unnatural disaster has actually created a unique landscape that is a beautiful reminder of man's destructive nature. Image thanks to Derek Tickner. The land forks heading south out of Hobart. Directly south, you'll find the rolling hills of the Huon River Valley and beautiful views over the D'Entrecasteaux Channel. To the southeast, you'll find quirky little shack villages like Doo Town before hitting the stunning Eaglehawk Neck on your way to the historic the Tasman Peninsula and Port Arthur. Driving south out of Hobart is a great way to see the rugged coastlines of Tasmania southern reaches and it's all easily accessible as a day trip. It's a little more than hour out of Hobart where you'll find that the road ends. The Huon River Valley is covered in orchards where you can stop to pick your own fruit along the way. But make sure to end up in the artsy little town of Kettering where you can board a vehicular ferry to Bruny Island. The road on the island is absolutely stunning and you'll want to head south to the South Bruny National Park. Here you can stand on towering dolerite sea cliffs while looking for migrating Southern Right Whales. The ride to Tasman Peninsula to Hobart's southeast is equally stunning. Impressive geological features wait for you like the Tasman Arch, Tessellated Pavement and Devils Kitchen. You'll pass over a 100-metre-wide stretch of sandy land that connects the Tasman Peninsula to mainland Tasmania in Eaglehawk Neck. 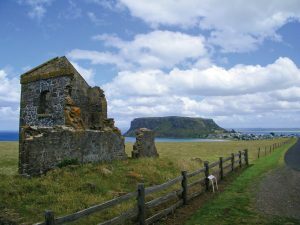 From there, you can explore the roads of the Tasman Peninsula on your way down to the historic Port Arthur where convicts were kept back in the 1800's. Image thanks to Tourism Tasmania and Rob Burnett. Motorcycles are available for hire at any of the 3 major Tasmanian cities -- Devonport, Launceston and Hobart. Devonport is a port town on the north coast where the Spirit of Tasmania ferry calls. Launceston is inland. It has an airport where you can find flights from other Australian capitals. 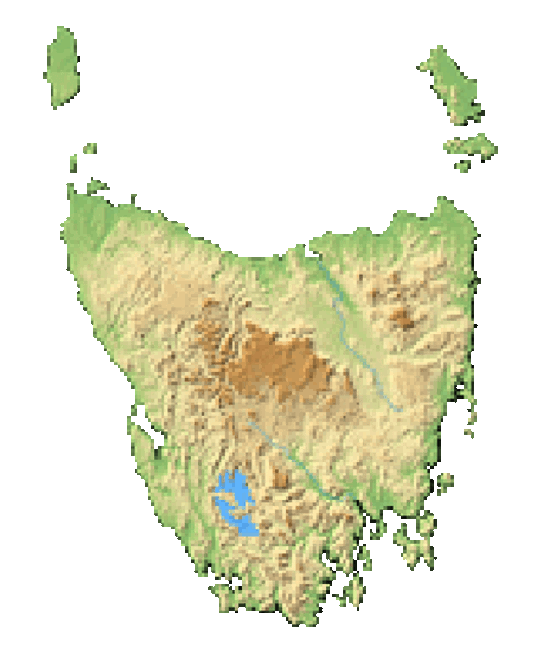 Hobart, on the south coast, has an international airport and is Tasmania's biggest city. And as the island's biggest city, you'll find the more choice and lower prices in Hobart. You'll need a motorcycle endorsement on your driver's license in order to hire a bike and you'll likely need to be at least 25 years old. Motorcycle licenses from other countries are usually acceptable but you'll have to present your passport if you're not an Aussie. Tasmania features great infrastructure and well-kept roads, but there are some things to keep in mind. While Tasmania has an incredibly temperate climate with temperatures that don't get too hot or too cold, you may experience rain. Parts of the island can get rainy at any time of year so pack some wet and cold gear. You'll have to be aware of gravel on the road as well as rocks and boulders through mountainous areas. You'll also find some mud where livestock crosses the road. And be aware of roadkill. 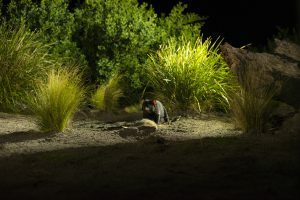 Much of Tasmania's wildlife is nocturnal and you may find marsupials on the road starting at dusk. Instead of dodging wombats, wallabies, Pademelons and Tasmanian Devils in the street, it's best to be done riding by dusk so you can enjoy the sunset. Image thanks to Tourism Tasmania and Rob Burnett. While it's rare to experience snow in Tasmania, the road can be frozen in the southern reaches of the island. Black ice can present itself and remain for an entire day if the temperature drops too low.